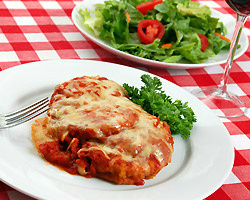 Preheat oven to 350°, Lightly spray a 9x9" baking dish with nonstick cooking spray, set aside. In large saucepan, bring 1/2" water to a boil. Add eggplant and zucchini. Simmer covered for 5 minutes. Carefully remove and drain. While simmering, add garlic powder to ricotta. 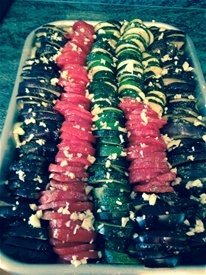 In baking dish, alternately layer eggplant, ricotta and zucchini. Spoon tomato sauce over zucchini, top with mozzarella and Parmesan cheese. Bake 25 minutes or until bubbly. Cut roasted eggplant into chunks, place in food processor with all ingredients. Process until smooth. Serve with pita chips and/or vegetables. In large saute pan, add oil and heat until hot but not smoking. Add onion and cook until softened, about a minute or so. Add pepper flakes and eggplant and cook until it softens, about 2-3 minutes. Add tomatoes, capers, olives and cook an additional 2-3 minutes. Add seasoning and serve over pasta or on toasted or fresh bread slices. TIAN is a french word used through Provence...refers to both a shallow cooking vessel and the food cooked in it. Preheat oven to 375. Arrange eggplant and zucchini in a single layer on a baking sheet coated with cooking spray. Lightly coat vegetables with cooking spray. Bake at 375 for 15 minutes. Arrange half of eggplant in a single layer in an 11x7" glass or ceramic baking dish, or gratin dish, coated with cooking spray. Top with half of zucchini and half of tomato. Drizzle 2 /14 tsps of oil evenly over vegetables. Sprinkle veggies evenly with 1/8 tsp of salt and pepper. Place bread in food processor and process until coarse crumbs measure 2 cups. Add cheese and next 4 ingredients - through garlic - to process until combined. Sprinkle 1 1/2 cups breadcrumb mixture evenly over tomatoes. Repeat layers with remaining eggplant, zucchini, tomatoes, oil, salt, pepper and breadcrumbs. Pour broth over top. Bake at 375 for one hour or until veggies are tender and topping is browned. Heat a Dutch oven over medium heat. Add curry powder, garam masala and mustard seeds and toast, stirring, until spices begin to darken, about 1 minute. Transfer to a small bowl. 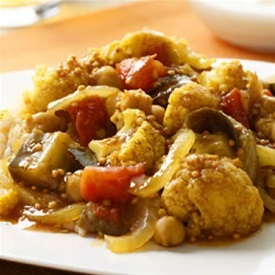 Stir in eggplant, cauliflower, tomatoes, chickpeas, water and the reserved spices. Bring to a simmer. Cover, reduce heat and cook, stirring occasionally, until vegetables are tender, 15-20 mins. top each serving with a dollop of yogurt if desired.